Through the hard work and dedication of its government and residents, Halifax has become one of the most progressive areas in Canada with its relatively low unemployment rate and impressive GDP. However, this does not mean that the area is without past tragedies and notable disasters which residents can learn from. Here is one of the most notable disasters in the area and how it can be prevented through Halifax first aid classes. In December 06, 1917, Halifax experienced one of the worst man-made disasters in the history of Canada in which two ships collided which resulted in high body counts and thousands of injuries. On this day, a cargo ship from France named Mont Blanc collided with a cargo ship from Norway in a strait called Narrows. What made this collision so fatal is the fact that the ship from France was carrying explosives. The collision caused the ship to burst into flames which ignited the said explosives. The explosion created pressure waves and tsunami which damaged all of the buildings and other infrastructures within the 800m radius including train stations. This will be later referred to as the Halifax Explosion. This disaster opened the eyes of many residents to the fact that major disasters can happen any minute and that it can cause other untoward events which can endanger the lives of many. Hence, being prepared for any disaster and knowing how to treat the injured should be a common knowledge among employers and employees who work in high risk workplaces. 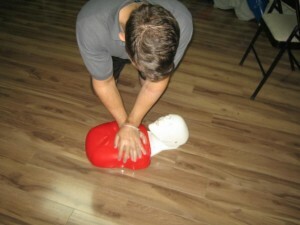 What Can First Aid Training Do? Through proper first aid training, employees can learn about the do’s and don’ts in areas that are considered as high risk workplaces such as cargo ships, piers and factories which make use of explosive or flammable materials. These are the workplaces where disasters and accidents are more likely to happen because of the presence of certain machines or even the mere nature of the business. Knowing these do’s and don’ts can lessen the likelihood of these disasters and accidents since employees will learn about the importance of observing non-smoking policies and other workplace policies. Employees who have undergone Halifax first aid training can also handle disasters and accidents more efficiently which will result to less or even no casualties in case these untoward events do happen. Normal occupational hazards such as choking or breathing problems will also be properly managed which can lead to lesser net loss due to employee tardiness or absenteeism.